Men of color formed the Autocrat Social & Pleasure Club in 1914 because the police often harassed them when they congregated in public. The Autocrat provided a safe space in Jim Crow New Orleans for members to get together and, among many other activities, host concerts by some of the city’s finest musicians. 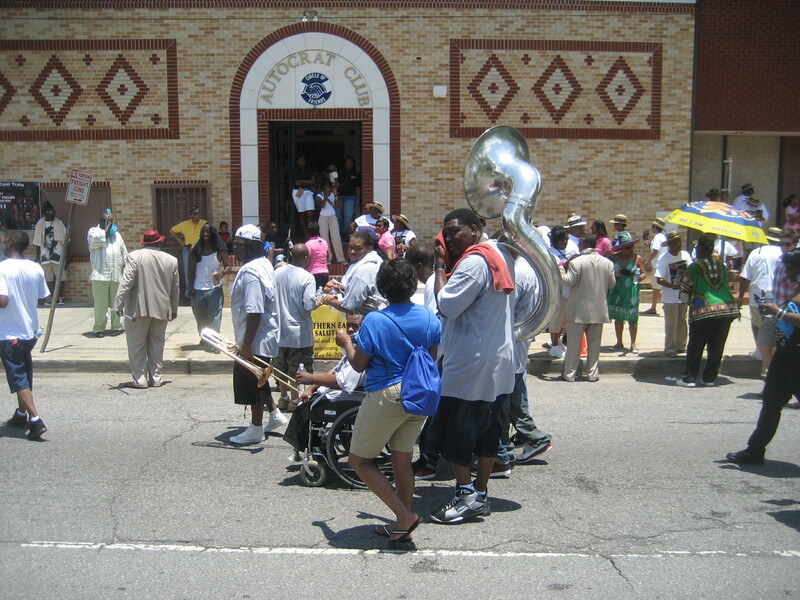 In the early years, at a couple of locations on and near North Claiborne Avenue, club members took in symphonies on Sunday afternoons. The Autocrat Club employed an orchestra that included Lorenzo Tio, Jr., a masterful clarinetist from a family of clarinetists. 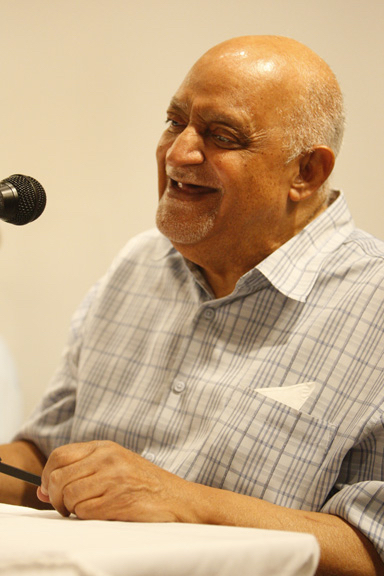 Tio heavily influenced early jazz by teaching its greatest clarinet players, including Barney Bigard, Sidney Bechet, Jimmie Noone, and Johnny Dodds. 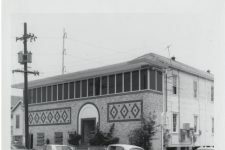 In 1924 the Autocrat Club moved to this building in the heart of the city’s creole community—its distinctive brick façade became a Seventh Ward landmark (the adjacent auditorium was a later addition). 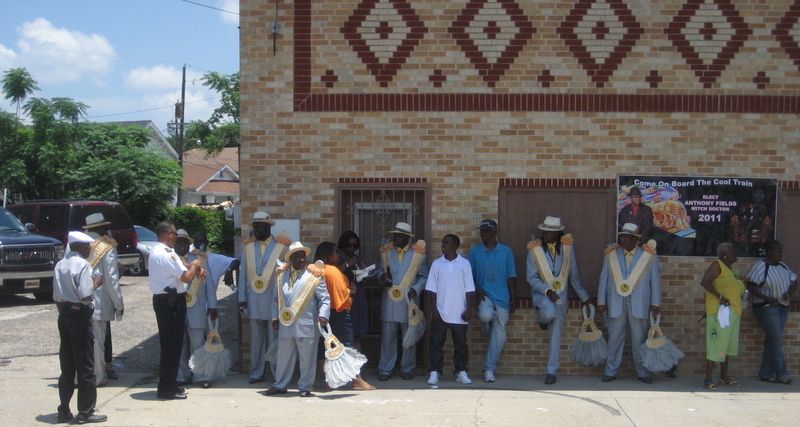 Scores of other black social clubs held functions at the facility. 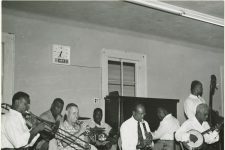 Dances, debutante balls, and Carnival celebrations filled the calendar, with society bands like the Moonlight Serenaders, with Lionel Ferbos on trumpet, providing the music. The Clyde Kerr Orchestra was a favorite, and a fertile training ground for future bandleaders. As popular tastes changed the Autocrat began hosting R&B bands like the Royal Dukes of Rhythm, formed by Wardell Quezergue, one of Kerr’s acolytes. Quezergue, who grew up in the Seventh Ward, became a renowned producer and arranger responsible for hits including “Chapel of Love” and “Mr. 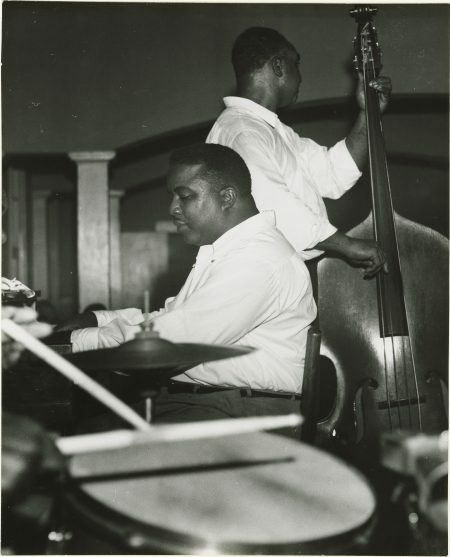 Big Stuff” — Allen Toussaint dubbed him the “Creole Beethoven.” In the 60s, a youngster who lived near the Autocrat, Carl LeBlanc, used to listen to the music emanating from inside the club. 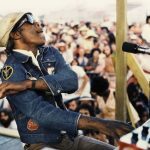 He’d go on to play guitar in Sun Ra’s Arkestra and banjo in the Preservation Hall Jazz Band (he was also in Stop, Inc., the band that recorded the locally ubiquitous “Second Line”). Brass band drummer and bon vivant “Uncle” Lionel Batiste was one of many to recall “the brown bag test” at the Autocrat. 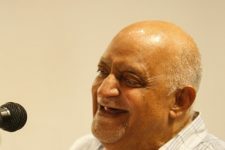 He told author Mick Burns: “It was a question of complexion—they’d hold a paper bag up, and if you was darker than the bag, they wouldn’t let you in.” The club, still active today, says they had no such rule and notes that its membership has always been diverse in this regard; other organizations renting the club for private functions may not always have been so inclusive. 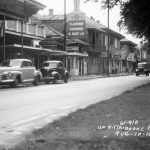 In Creole New Orleans: Race and Americanization, historian Arnold R. Hirsch argues that the Autocrat, under the leadership of A.P. Tureaud, helped unite black communities across the city in the pursuit of equal rights in the 1930s and 40s. 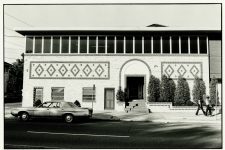 The club’s auditorium held civil rights meetings in subsequent years as well. 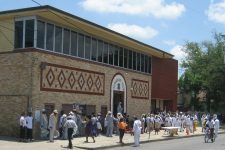 Though the building was badly damaged by Hurricane Katrina and the ensuing flood, the Autocrat Club renovated and reestablished a full slate of activities, including regular fish fries and dances on weekend nights. Other social aid and pleasure clubs still hold functions here, with modern brass bands and DJs. 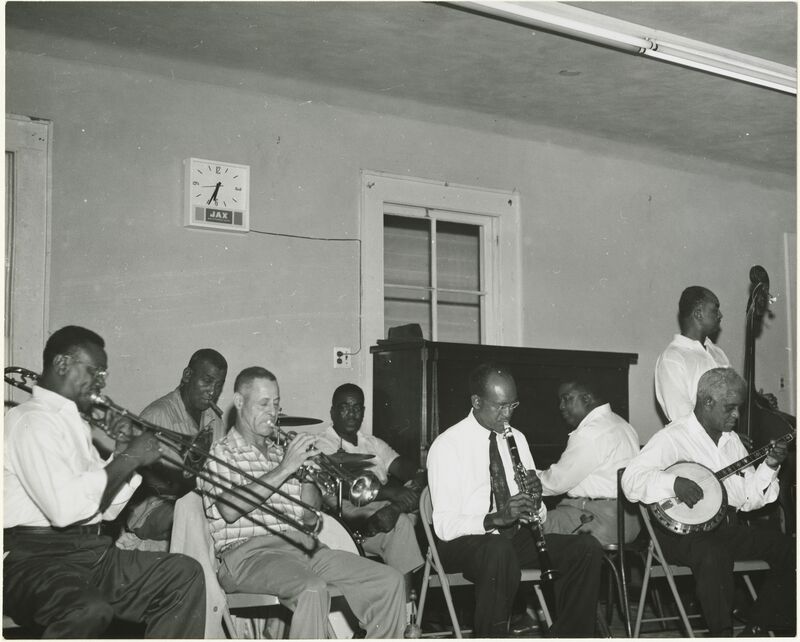 From 1958, members of the Lawrence Marrero Polo Barnes band rehearsing at the Autocrat Club. Marrero and Barnes had played at the Autocrat in Chris Kelly's band decades earlier. 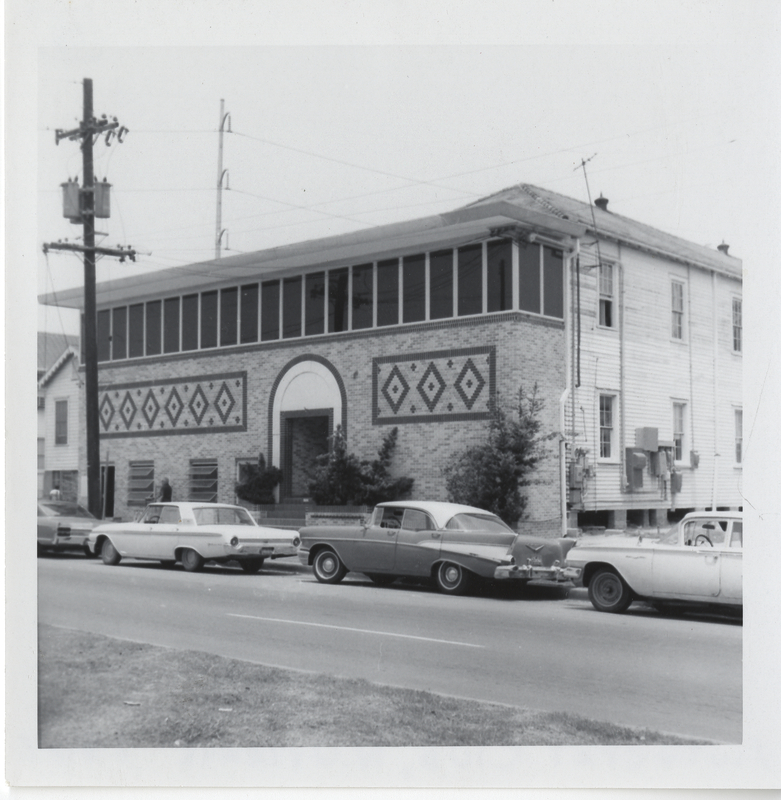 Courtesy of Hogan Jazz Archive, Howard-Tilton Memorial Library at Tulane University. Photo by Ralston Crawford. 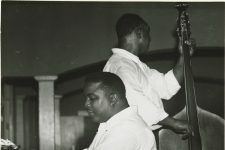 From 1958, Dave Wins at the piano and McNeal Breaux on bass rehearse at the Autocrat Club. Courtesy of Ralston Crawford Collection, Hogan Jazz Archive, Howard-Tilton Memorial Library at Tulane University. Photo by Ralston Crawford. 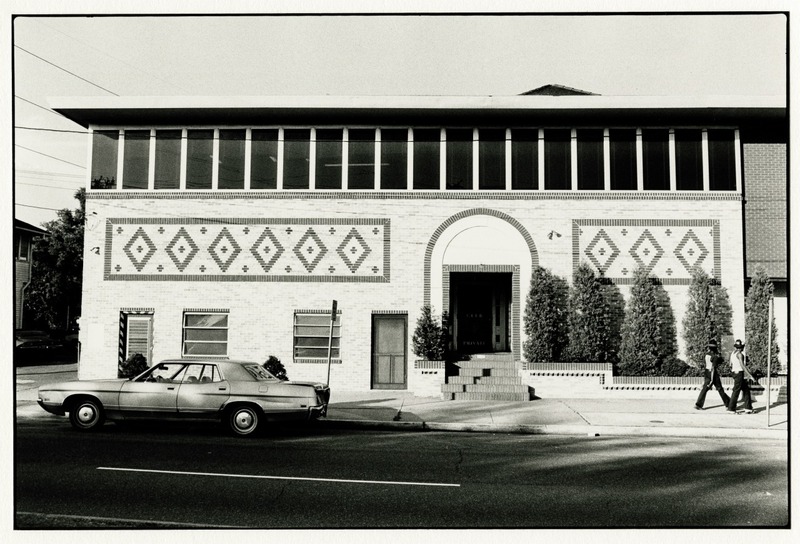 The Autocrat Social & Pleasure Club in 1967. The Autocrat Social & Pleasure Club in 1978. 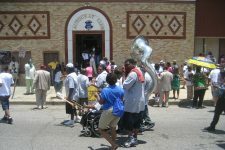 From 2010, the Zulu Social Aid & Pleasure Club's 101st Anniversary Parade stopping at the Autocrat Club. 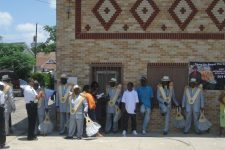 From 2010, members of the Hot 8 Brass Band, including leader Bennie Pete on sousaphone, outside of the Autocrat Club.